Soon after Sawyers joined in 1965, Hollis and Ashton left (the latter for labelmates The Mojo Men) around the time of the second 45's release. Bailey recruited another female drummer called Kristy and they were augmented by Bob Moseley on guitar, but he moved quickly on (to Moby Grape) and was replaced by guitarist Richard Fortunato, formerly of The Preachers. Early 1966 and Autumn Records were in financial difficulties. All of its roster was transferred to Warner Brothers. By then The Vejtables had nearly folded - in April 1966 Jim Sawyers left for The Syndicate Of Sound and Frank Smith also disappeared. Bailey and Fortunato were hangin' tough and drafted in two more ex-Preachers when Leo De Gar Kulka of Golden State Recorders offered them a contract with Mercury. This incandescent but short-lived line-up produced the superb Uptown 45, featuring the raga-punker Feel The Music backed by Shadows, an excellent piece of experimental psychedelia. Both sides can be heard on Sound Of The Sixties - San Francisco Part 2 and Crystallize Your Mind CD; Feel The Music is also on Mayhem and Psychosis Vol. 2 and Pebbles Vol. 12; Shadows is on Acid Dreams. Speculation over the years about the quality of the other tracks from these sessions had given them a legendary tag amongst collectors. Finally in 1994 Big Beat's Good Things Are Happening CD unearthed this handful of nuggets - Good Things Are Happening, Time And Place, Better Rearrange, Hide Yourself and Good Times - and expectations were met in FULL (kudos to Alec Palao). Five awesome proto-psych freakouts with strong sneering vocals from Fortunato and slabs of distorted guitar and feedback. 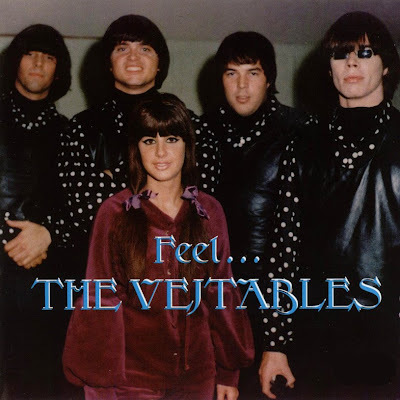 Clearly influenced by the Yardbirds, The Vejtables had leapt forward to join that band in the musical vanguard at the dawn of the psychedelic era. Bailey clung onto the band's name for another year but the personnel was erratic, as apparently was his behaviour. Another 45 did eventually surface in late 1967, with Frank Smith on board again, but was released as by the Book Of Changes. Fortunato had long gone onto a string of fascinating outfits - to George Caldwell's Bees, later the W.C. Fields Memorial Electric String Band, then ESB, and finally Fields.